"In March 2016, before the German parliament, Sheikh al-Tayeb made unequivocally clear that religious freedom is guaranteed by the Koran, while in Cairo he makes the exact opposite claims..." — Cairo Institute for Human Rights. It is difficult, therefore, to see this document as anything more than a superficial show, presumably for the West, and al-Tayeb's signature on it unfortunately not worth all that much. 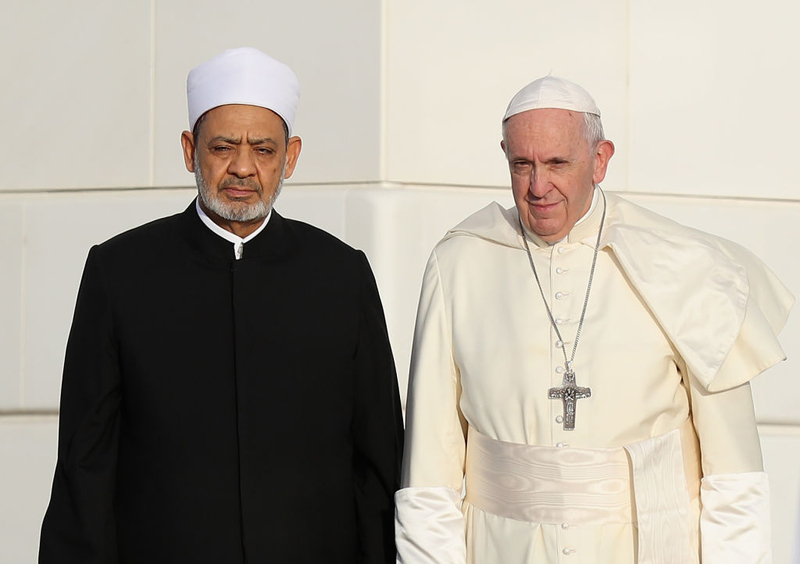 The two foremost representatives of Christianity and Islam, Pope Francis and Sheikh Ahmed al-Tayeb — the Grand Imam of Al Azhar who was once named the "most influential Muslim in the world" — just signed "A Document on Human Fraternity for World Peace and Living Together." The Document "forcefully rejects," to quote Vatican News, "any justification of violence undertaken in the name of God," and affirms "respect for believers of different faiths, the condemnation of all discrimination, the need to protect all places of worship, and the right to religious liberty, as well as the recognition of the rights of women." The Document is being portrayed as a "historic pledge of fraternity" and applauded as a "historical breakthrough." The problem is that one of the two men who signed it, Dr. al-Tayeb, has repeatedly contradicted — when speaking in Arabic and appearing on Arabic media — all the lofty sentiments it highlights. "at this sensitive time — when murderous terrorists rest on [Islamic] texts and understandings of takfir [accusing Muslims of apostasy], murder, slaughter, and beheading — Al Azhar magazine is offering free of charge a book, the latter half of which and every page — indeed every few lines—ends with 'whoever disbelieves, strike off his head'"? "It's amazing, Al Azhar insists ISIS are Muslims and refuses to denounce them. Yet Al Azhar never ceases to shoot out statements accusing novelists, writers, thinkers — anyone who says anything that contradicts their views — of lapsing into a state of infidelity. But not when it comes to ISIS." It [Al Azhar] can't [condemn ISIS as un-Islamic]. The Islamic State is a byproduct of Al Azhar's programs. So can Al Azhar denounce itself as un-Islamic? Al Azhar says there must be a caliphate and that it is an obligation for the Muslim world [to establish it]. Al Azhar teaches the law of apostasy and killing the apostate. Al Azhar is hostile towards religious minorities, and teaches things such as not building churches, etc. Al Azhar upholds the institution of jizya ["protection money" demanded of non-Muslims subjects]. Al Azhar teaches stoning people. So can Al Azhar denounce itself as un-Islamic? "I have noticed that they are always telling us that terrorism is Islamic. All those mouthpieces that croak — out of ignorance or because they were told to — that the Al-Azhar curricula are the cause of terrorism never talk about Israel, about Israel's prisons, about the genocides perpetrated by the Zionist entity state... If not for the abuse of the region by means of the Zionist entity, there would never have been any problem."